Such a city, and so many places to shop. Okay, so that was a bit of overstatement. But you have to cut me a bit of slack. I live in a city of 1 million people at the end of the Earth. There really isn’t that much variety, and we aren’t close enough to take real advantage of the Tiger economies. At best we’ve been invaded by a few chains of the Kangaroo economy (pun intended). Where should you shop in Singapore? If you have the world’s largest bank balance, then feel free to wander the big name designer boutiques in the shopping malls along the tourist strip known as Orchard Road. My Visa card may be my “flexible friend” but it doesn’t flex that far without snapping, so I am a poor source of informative comment on the value you may get from visiting such plush outlets. If, however, you are of more modest means and are willing to do a bit of ‘tourist time’ as well as ‘local time’ then there are quite a few places to visit. First things first, before I start. Rule 2: Know what is “fair value” for what you want, in your home market. I hate shopping. I mean it. I really hate shopping. But when I go overseas I can’t seem to help myself. It is almost like a compulsion. I must shop. I mean, I must at least window shop. I’d like to pass it off as something akin to “being interested in the local culture”. Sadly, I don’t think that fools anyone. The reality is, I’m like a kid in a candy shop. Being the poor retail deprived soul that I am, it is like a whole new and wonderful world is opened up. I can actually see myself prising open my wallet, evicting the resident moths, extracting my dusty but faithful credit card and actually buying something. And not just any old stuff, but nice things. Things I might actually enjoy buying, wearing, using, displaying and generally bragging about from my trip to Singapore. If you are looking for electronics, computers, cameras and the ilk, take a visit to Funan DigitaLife Mall mentioned in my previous entry or make a trip to Sim Lim Square for a much more “local” electronics and IT experience. Or, if you really must, visit their website directly for more information. I am reliably informed by a friend who was an expat working in Singapore that Sim Lim is actually the place to go, so for geeks, this is your stop. But don’t forget to walk down the street to Little India for more shopping and yummy food experiences ! Your life must not revolve around your iPod, okay! Now on a slightly more girly topic, clothes and shoes. Where should you go? Well, that depends on your taste and budget. Despite what I said earlier about Orchard Road, there are possibilities for those of us not quite so label addicted. But you must be patient. If you have a black belt in shopping, you will manage this without any great trials. If your attention span is a little bit shorter however, you might want to take a shortcut to this website and get an overview of what there is and what is going to suit your taste. Personally I have visited Parkway Parade, Marina Square, Millenium Walk, Suntec City, North Bridge Road, Orchard Road and Chinatown. I have my favourites, but I imagine yours will be different, so taste test as many as you feel you can stand. This trip ended up being a bit about shoes for me. Here in NZ shoes can range in price from $40 to anywhere over $100, depending on what they are and where you’re buying them from. If you want really nice shoes, in my not-so-humble-opinion, you need to be looking nearer the top end of that scale than the bottom. Imagine my joy when I discovered that I could buy shoes that were actually very nice, stylish and/or comfortable for S$50 or less. Now, I don’t own an Imelda Marcos collection of shoes, but I did succumb to the lovely designs and even lovelier prices and have taken my very first steps into that dark world of fashionable shoe ownership. In this instance my shoes came from Marina Square and Parkway Parade. This pretty much applied to my meagre clothing purchases as well. I must make a note about clothes shopping, before moving on. Okay. I’m a fairly average woman of European stock. I don’t rate an anorexia alert, but (hopefully) I’m not on the verge of requiring a muumuu to hide my faults either. Unfortunately for me I am probably in the muumuu wearing range for your average Singaporean woman. Don’t visit this country and expect to buy “Medium” anything. If you share similar heritage/shape to me, expect your ego to be badly dented by an “L” and “XL” debacle or possibly a size “16” through “18” and on upwards nightmare. And be grateful that you were lucky enough to actually find them! I fell in love with a shop. I know, it shouldn’t be acceptable in polite society, but I did. If you haven’t visited Oh Waily before, it is possible that you don’t know that I am a bit of a bookaholic, but I am. In addition to this I am also something of a paperaholic – clearly a distinct sub-category of addictions to printed paper materials like books. Therefore it should come as no surprise that I struggled mightily with a visit to the Prints shop in the Raffles City Shopping Centre. I was strong though, I came away with only one A4 size blank journal, but a horrible urge to request franchise details so that I can have my very own den of iniquity and constant fix of things paper and bound. Their site is partially complete, but if you visit the “Shops” tab you will get a small idea of what I was up against. Now, on to the touristy stuff. What are you going to take home as a “tourist” momento? I’ll own up to pilfering a coaster from Raffles’ Long Bar. It was pretty, okay?!? Then there is the choice of general cultural options. Pretty much everyone takes home a Merlion something from their first visit. After that, it takes a bit of thought. On the funny side, you can take home the “It’s a Fine City” t-shirt that takes the mickey out of Singapore’s stringent laws and fine system. But it you feel that you want something a little less obviously touristy, then you might need to think about it a little bit more. Personally this has never been a problem for me. I have always had a fondness for Chinese culture, (don’t ask me why – I have no idea), and their various art forms. This makes shopping for a unique take-home item that much easier. Last time it was a nice little scroll of Fu Lu Shou calligraphy. This time it was a dirty great scroll with a One Stroke Brush Painting by Siong Shi. We took the usual pilgrimage to Chinatown and I was very disappointed to see the changes since my last visit about five years ago. The main shopping street, Pagoda Street, was absolutely full of stalls. They weren’t restricted to the shophouses as previously, and the entire street was just jammed full of cheap and nasty tourist junk. It was such a let-down. Fortunately The Red Peach was still there, and it is truly an oasis of taste amongst the cheap and nasty. And after a long deliberation we came away with our scroll. It is a “Fish Painting on Rice Paper”. Here is what is all means. 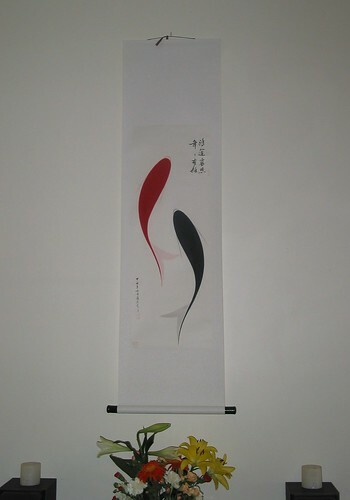 The calligraphy means “good fortune, abundance and blessings”. The fish is symbolic of abundant good fortune, prosperity, peace, happiness and success. A pair of black and red fish is symbolic of good things coming in a pair – blissful union. Black is symbolic of warding off bad, negative forces or influence. Red is symbolic of inviting all the good, strong positive forces, influence and luck. Oh, and I guess I should mention that the entire scroll is just a touch over five feet long top to toe – so it’s only just slightly smaller than me! So now I am looking forward to Christmas and the New Year as I’m sure to have more good fortune, happiness and abundance of all sorts. Go the Fish!